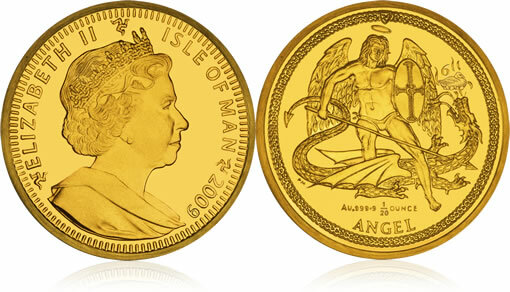 Every Christmas the Isle of Man releases a special 1/20oz Gold Angel of which only a limited number are struck. The privy mark on its reverse reflects the 12 Days of Christmas theme, which make the Angel Coin unique. This year the 2009 Christmas Angel design features both traditional and new design elements. Since medieval times, Angel coins bearing the design of Archangel Michael slaying the Dragon have been thought to bring good luck and health to the bearer and the modern Angel Coin, which is one of the World’s foremost bullion coins, continues to uphold this remarkable legend. 1984 saw the release of Pobjoy Mint’s very first Gold Angel coin which depicted a classical image of Saint Michael with heavily feathered wings astride the fiery Dragon. A Celtic band appeared in the surround which was broken at the top of the coin with an image of the Isle of Man Triskeles. The 2009 design combines the classical appeal of the original design, including elements such as the Celtic band and feathered wings, and a powerful modernised image of Saint Michael slaying the Dragon. A repetition of the Triskeles symbol also appears in the centre of the St George’s cross on the shield. This year is the sixth coin in the 12 days of Christmas series and depicts ‘Six Geese a-laying’ as a privy mark on the Angel coin. This collection will continue for the remaining six years to complete the carol. This legal tender, 24 Carat Proof Gold coin has been approved by Buckingham Palace and bears a fine effigy of Her Majesty Queen Elizabeth II, by Ian Rank-Broadley FRBS FSNAD on the obverse. The coins are produced to the highest quality and struck four times to produce a stunning mirror–finish background with the design sculpted in striking relief. Each coin is encapsulated and presented in a handmade case with a certificate of authenticity making them a wonderful Christmas present for coin collectors, young and old. The Pobjoy family have been associated with fine metalwork since the Middle Ages. The Company was recently granted permission to use the family Coat of Arms in which the Medieval Popinjay is the central motif. Over the past three centuries, the Company has been involved in many diverse fields, but they have always been involved in metal, both base and precious. For the past 100 years the Company has been deeply involved in the development and manufacture of coins, medals and tokens. Do you know where i can buy a 1984 isles of man gold angel coin from, but a 1 10th or 1 20th size. Where is the six geese laying eggs?